The Ba-64 was a soviet light armored vehicle used during the Second World War. It was developed out of the GAZ-company’s own initiative during July 1941. It was based on the GaZ-64 jeep and featured sloped armor. I was operated by a crew of two and sported a 7.62mm DT machine gun as offensive armament. Other variants like a rail cart version, personnel carrier and half-track were also tested, but were left behind in the prototype stage. Early in combat the Ba-64 proved very useful, despite its lack of heavy armament it proved itself during many reconnaissance and liaison missions. 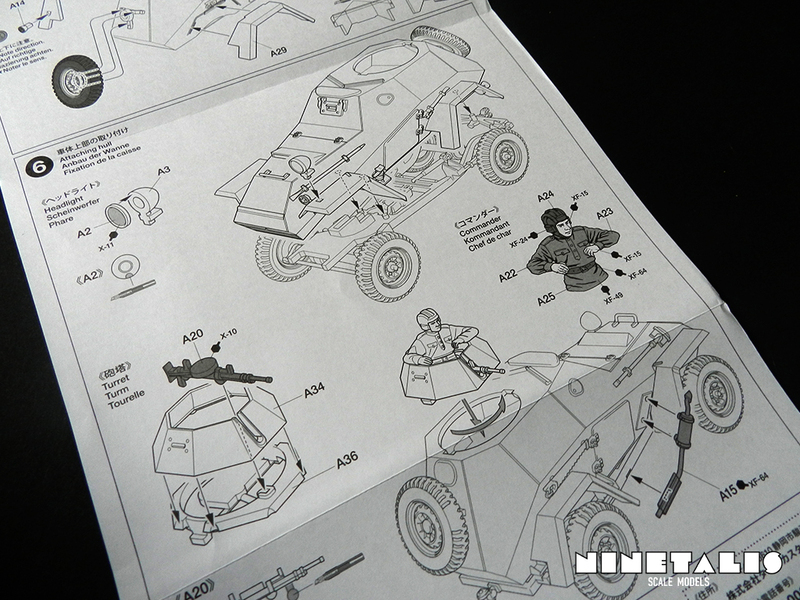 Early versions of the vehicle had the tendency to roll over on rough terrain because of its top heaviness, but this was fixed with the B version which sported a wider wheelbase and a turret with a guns. The thickness of the armor varied between 6 and 15 centimeters. Most of the body and the entire turret was between 9-10 centimeters thick, most of it sloped at an angle of 30 degrees. When opening the box it is kinda shocking, because there isn’t a lot inside. There is just one sprue, a leaflet and a tiny decal sheet. 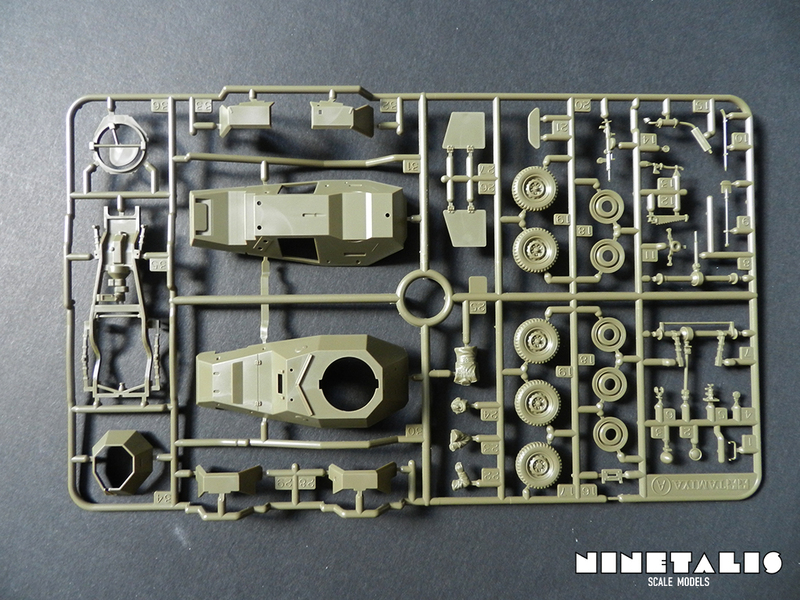 The sprue is really small and it’s a bit intriguing to think how a whole armored car can go on one sprue. But let’s not judge on size and find out what this kit has to offer. So, as said before there is only one sprue. It holds everything so I won’t go over what parts are where, but focus on how they are divided. 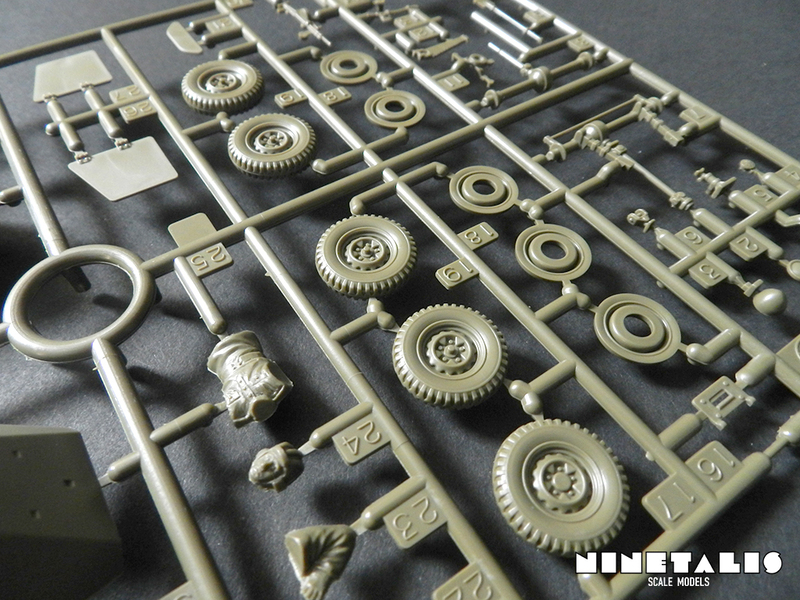 In total we can find 43 parts on the sprue. The fuselage and turret halves are divided in a top and bottom half, and we can find the chassis divided in a couple of different parts. There are also the four fenders and five wheels (one is a spare wheel to put on the back of the car). Last but not least, a figurine is also included, which is divided in different pieces. The parts are quite detailed and there is nearly no flash on any of the parts, aside from a little bit on the figurine, which can be easily cleaned up. 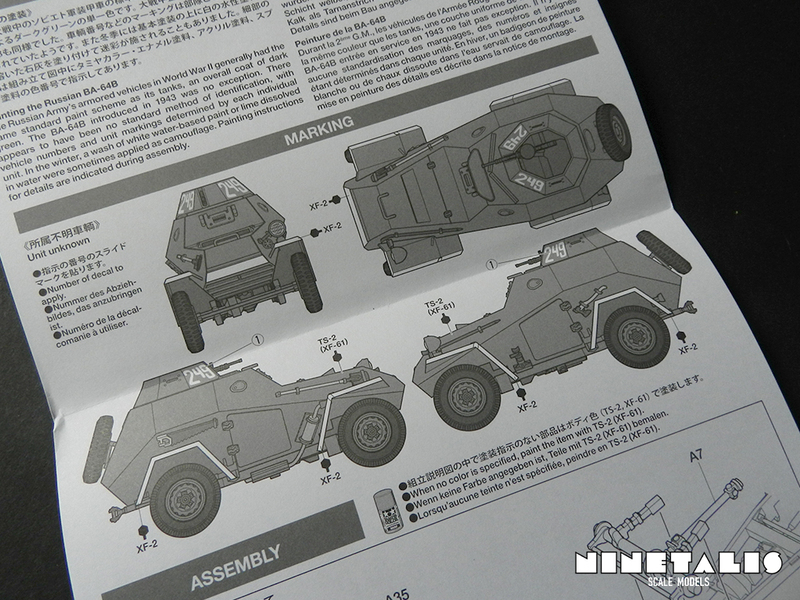 The most notable absence from the kit is that there are interior parts at all. 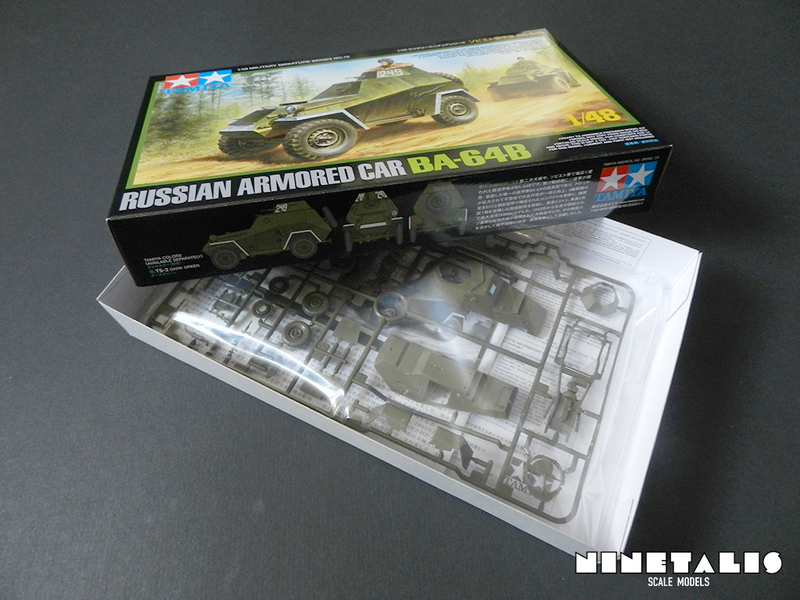 It is not really that surprising, since I haven’t met a single 1/48 armor kit from Tamiya that has interior parts, aside from their trucks and jeeps and such. But that is just it, I would rather associate the Ba-64 with trucks and jeeps instead of tanks. Not only that, but the interior of the real Ba-64 is really spartan and could be complete with maybe five extra part added to the frame. This leaves me a bit dazzled why the manufacturer would not include a few parts to replicate an accurate interior. Maybe we’ll see an added interior in a future release so who knows. Yeah, not decals. Although there are 2 decals in the kit, it is just two times the same number ‘249’, which has to be placed on the turret. There isn’t a lot else I can say about it so I will just leave it with this. 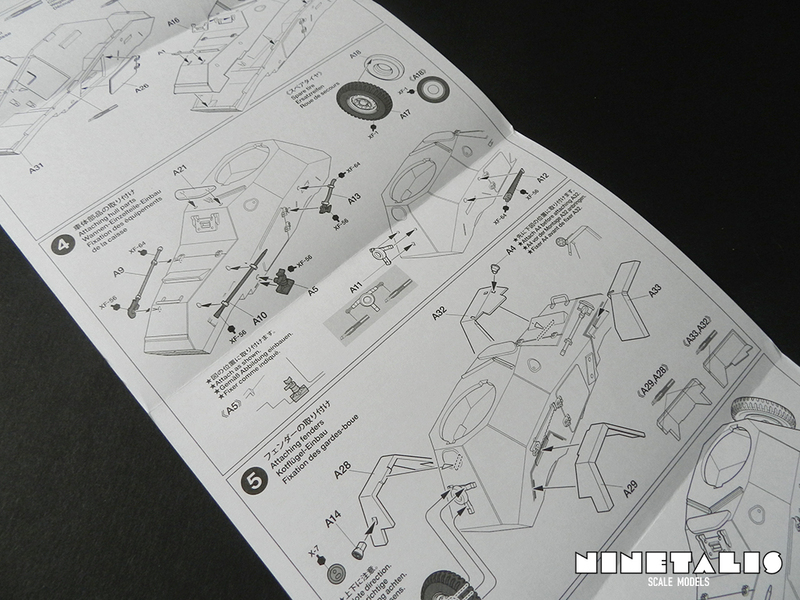 The instructions are as any Tamiya kit and seem to be quite clear. 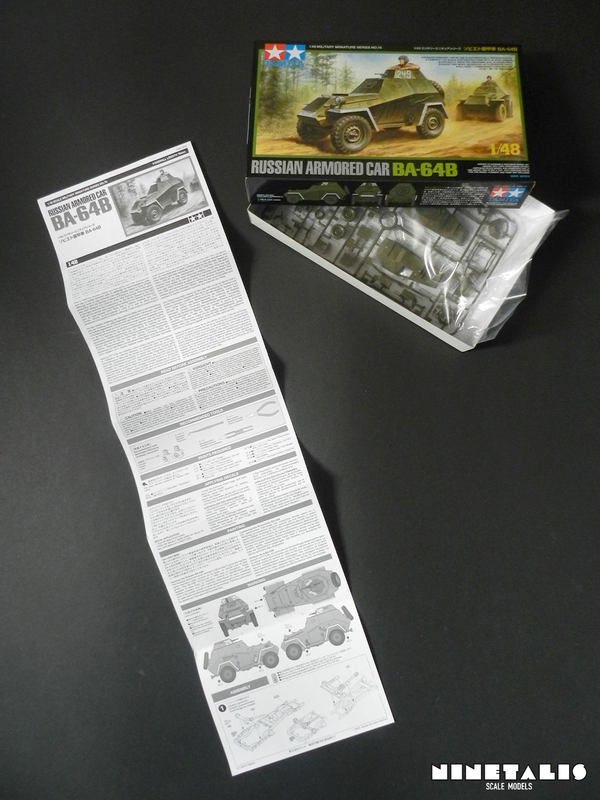 The instructions are printed on a long sheet of paper, which folds into a small leaflet that is about half the size of the box. There is only choice of markings, which is kinda sad in my opinion. 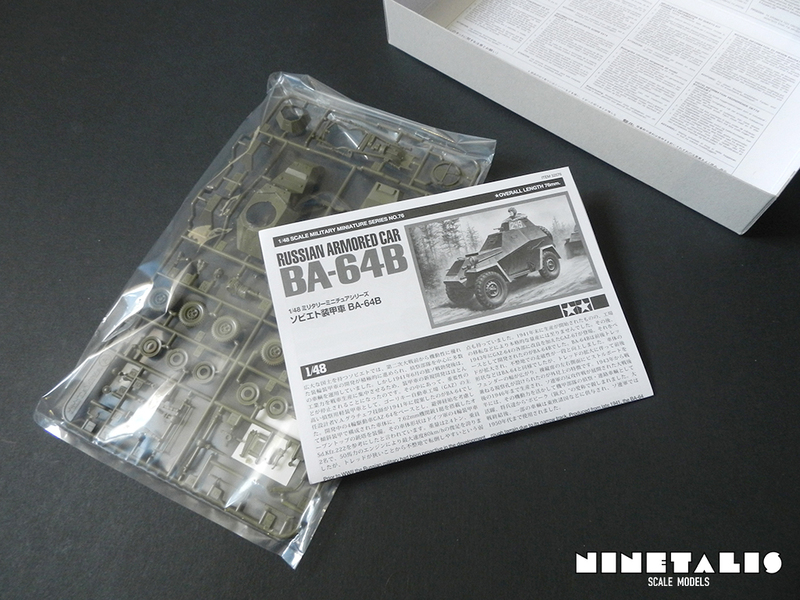 Even considering that most of the Ba-64’s looked about the same, there were still over 9000 produced and used for over 15 years, so it’s a bit saddening that Tamiya left us with only one choice. A note on this camouflage is that the side of the fenders and the front and back part of the body would be painted partially white. This was part of a tactic called Maskirovka, or military deception. These white bars where used when Soviet columns would only move at night. The white paint made sure that the drivers could see the machine in front, as they couldn’t use any lights to navigate. By day they stopped and camouflaged themselves so that the Germans would not notice the presence of the all the mechanized ground equipment in the area. Soviet planes would fly over to see if they were camouflaged well enough. If they were able see them, pilots would drop a white beacon so that the ground troops would know they were visible from the air. Well, I’m not sure what to say of the kit. It looks great and the fit will probably be astonishing as we are used from Tamiya, yet still it feels a bit off to me. Opening the box with just finding one single sprue is a bit upsetting. 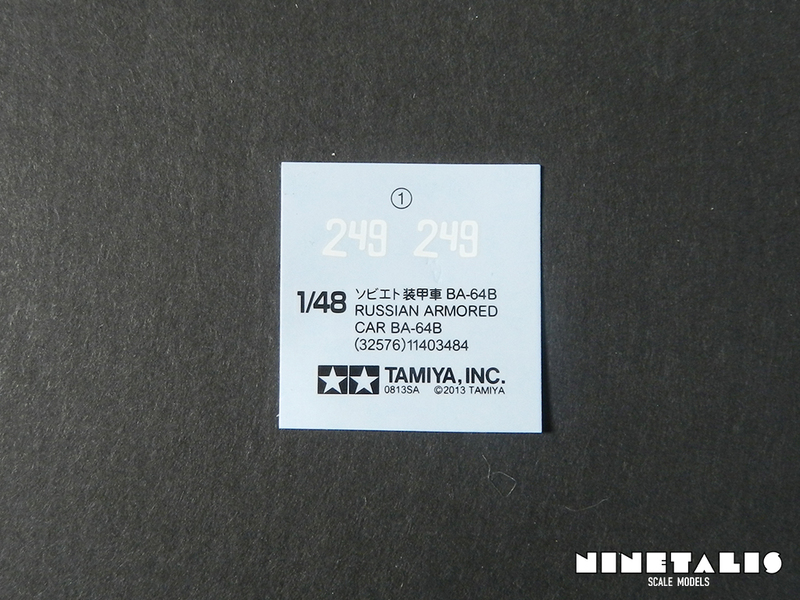 Tamiya could have easily made up by adding more markings, but leaves us with just one single choice, something we aren’t used from them, especially in the 1/48 armor line. There are quite a few possibilities out there for Ba-64’s, so why they didn’t added a few more decals is a mystery. 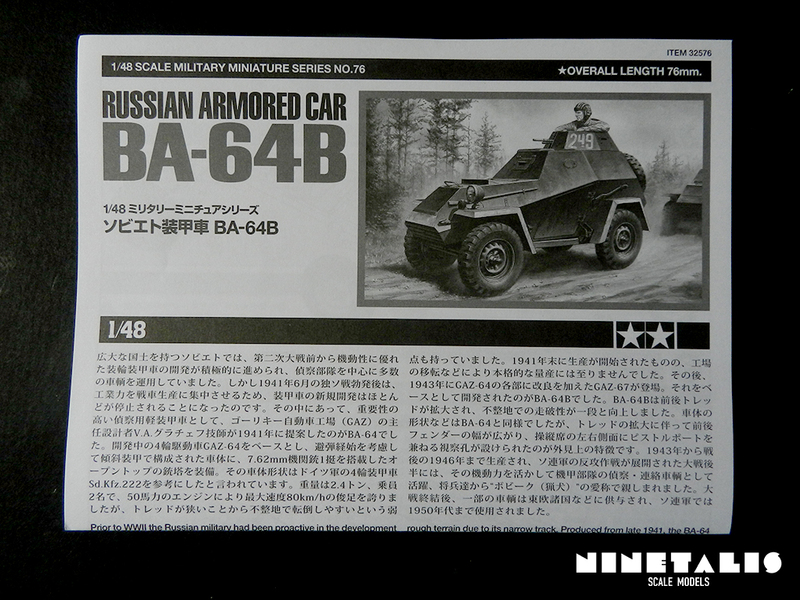 Also the Ba-64 had a few variants with tiny design differences, but this seems to be another field that Tamiya left unexploited. 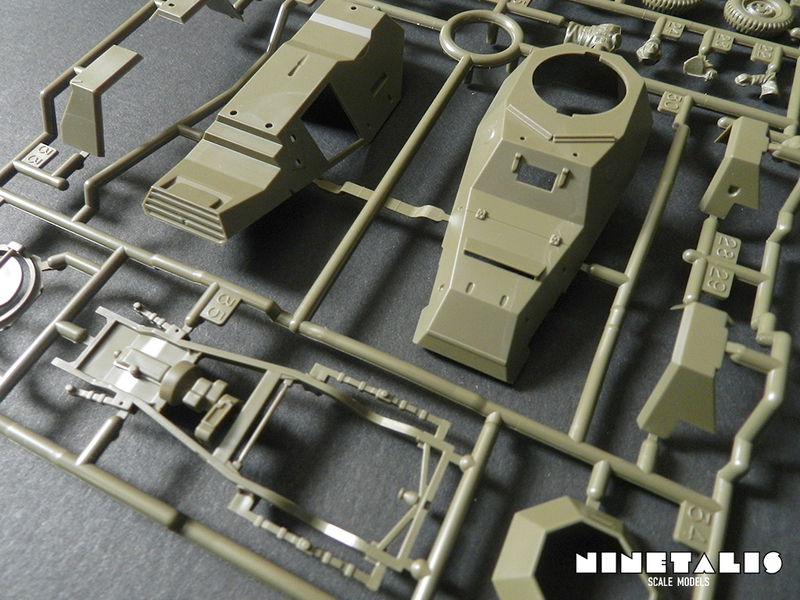 On the other hand, the kit is quite cheap, so in all honesty we can’t really complain on having just one sprue. Two small sprues wouldn’t have made it any better, and I would probably have went on about how the two small sprues ‘made it look as if we had more to work on and they could have fitted it on one small sprue’. At the end of the day, it is a good looking kit and it is worth getting it for your diorama or even showing it off all by itself. It is great to see more and more vehicles in the ‘quarter’ scale for diorama’s and Tamiya filling up this void with an armored car that hasn’t been released in 1/48 before can surely be applauded. They got the looks right and it seems accurate to the real deal. It looks like a quick and easy build and is definitely recommended to everyone.